A member of Joint Task Force 2 shot and killed an Islamic State insurgent using his McMillan TAC-50 sniper rifle, at a distance of more than 3.5 kilometres. Two officers responded to a complaint of a male brandishing a knife in Burnaby, B.C. ; after a failed attempt by one Mountie to Taser the suspect, the second officer shot him in the abdomen with her Smith & Wesson 9 mm pistol. In remote wilderness in Northern Ontario, a Canadian Ranger fired his .303-calibre Lee-Enfield Mark 4 bolt action rifle six times into the air in hopes of attracting the attention of a missing trapper he was searching for. Camped nearby awaiting rescue, the trapper fired twice in response. Although separated considerably by distance, time and details, these shootings share one thing in common: They involve federal employees using government-issued bullets. Every year, the Canadian government buys a whole lot of ammunition – the total annual cost of that ammo to the Canadian Armed Forces, the RCMP, and our corrections and fisheries officers is more than $160 million. But while the government is obligated to invite competing bids for most procurement activities, when it comes to bullets, there’s only one shop in town: global aerospace and defence giant General Dynamics, based in Fairfax County, Virginia. A 1,450-employee subsidiary known as General Dynamics Ordnance and Tactical Systems (GD-OTS) Canada manufactures most of those bullets at three plants in Quebec, all of which were once federally owned. Right now, General Dynamics has a sweet deal: In return for ensuring we have a made-in-Canada supplier in the event of war, the government pays GD-OTS Canada a fee of more than $70 million per year – in addition to the cost of any ammunition we buy. It’s hard to say whether we’re getting bilked, as neither the feds nor the company will reveal the per-bullet cost. But Minister of National Defence Harjit Sajjan seems curious. Three years ago, he commissioned a review of the federal Munitions Supply program “to ensure the underlying principles of the program are still relevant, while examining its performance and benefits for Canadians.“ The report is due this year. In the meantime, here’s what we know about our secretive bullet maker. As part of broader efforts to understand what the federal government purchases and how, The Globe and Mail obtained federal procurement data from ThinkData Works, a Toronto-based data services company. Although the federal government makes this data readily available online, ThinkData cleaned and processed it in ways that made it far easier to analyze and understand. One of the data’s more surprising revelations is just how much ammunition Ottawa buys: an annual average of about $230 million between 2009 and 2016. That includes small arms ammunition for assault rifles and pistols, plus everything from grenades to artillery shells and mortar rounds. The vast majority of it goes to the Canadian Armed Forces, whose ammunition needs include not only small arms but also a wide array of specialized weapons mounted on tanks, ships and aircraft. By value, ammunition purchased for the second-largest federal user – the RCMP – costs barely 1% as much. Ottawa’s reliance on the company is almost total. The company, in contrast, is among General Dynamics’ least significant subsidiaries. Sometimes known by its acronym GD-OTS (pronounced “jee-dots”), it employs 1,450 and operates three plants in Quebec. Although there’s little publicly available information about its finances, over the years it’s been often suggested that half or more of its production is exported, mainly to the U.S.
GD-OTS Canada is closely related to a company with the same name (minus the ‘Canada” bit) based in St. Petersburg, Florida. That company is one of three business units that comprise General Dynamics “Combat Systems” group. During the last three years, revenues from the entire weapons systems and munitions operations ranged around $1.5 billion, or less than 5% of the company’s total. The word “ammunition” occurred just three times in General Dynamics’ latest, 80-page annual report. Ottawa’s ammunition budget might seem huge, but it’s actually a relatively insignificant purchaser in the global arms trade. And it can’t satisfy its needs at your local sporting goods store. Hunters typically use hollow-point ammunition that expands upon striking a target, which causes greater tissue damage. Military small-arms ammunition, in contrast, must conform to the Hague Convention. The Armed Forces buy “full metal jacket” bullets that don’t “cause undue harm to the enemy,” a government spokesperson explained. Similarly, there’s no commercial market for 120 mm tank ammunition and 57 mm rounds for naval guns. “They can’t put on a sale for hand grenades at Walmart, or give a two-for-one special,” the spokesperson explains. “So they wait until they have an actual sale before they commit to production.” Lead times are huge as a result: From order to delivery, this process can take between 18 months and three years. 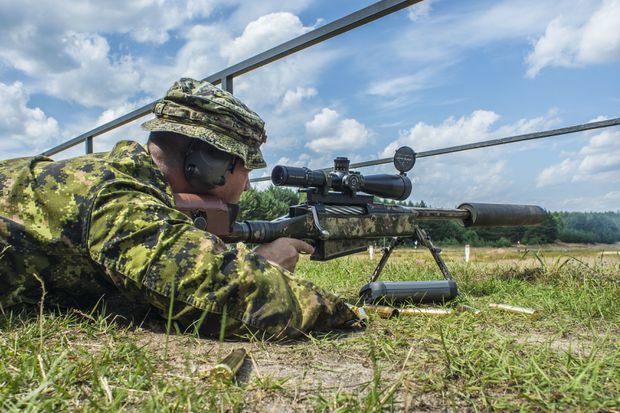 The Canadian Armed Forces replenishes its stocks of ammunition for training and operations annually. It sends a requisition to Public Services and Procurement Canada, the department responsible for most of Ottawa’s buying. GD-OTS provides the government with cost estimates for material, labour and other expenses, and the government adds permissible profit margins to each component, as laid out in its Supply Manual. GD-OTS declined The Globe’s request for interviews and a plant tour. But experts familiar with the process said the company can produce a variety of ammunition using the same equipment; lines can be reconfigured, sometimes in a matter of hours. Prior to accepting delivery, federal bodies typically test ammunition to ensure it meets accuracy, velocity, lethality and other requirements. For an order of 9 mm rounds put out to tender last year, the RCMP insisted that “five-shot groups must average not more than 15 centimetres at 25 meters fired from a 9 mm RCMP service pistol, hand held on a sandbag rest.” The Department of National Defence sometimes observes GD-OTS testing ammunition at their shared test facility in Nicolet. GD-OTS supplies most of Canada’s ammunition for one reason: the federal government doesn’t trust foreign companies. It fears that during wartime, offshore suppliers will wind up supplying their own national governments, leaving Canadian soldiers with empty magazines at the worst possible moment. This fear dates almost from Confederation. Back in the late 1870s, the Snider Enfield breech-loading rifles and ammunition the British left behind were becoming obsolete. Ottawa might have again turned to Britain to hammer out some kind of supply agreement. But informed partly by Britain’s various imperial adventures, Canada instead chose to make its own ammunition. In 1881, the government opened its first cartridge factory (later renamed Dominion Arsenal) in Quebec City. In practice, Canada remained dependent on foreign producers for decades afterward. But during the Second World War, the federal government doubled down on its made-in-Canada strategy. It built new Dominion Arsenal plants in Quebec, notably a large-caliber manufacturing facility at Le Gardeur and an “energetic materials” plant in Valleyfield. During the war, these plants employed thousands; afterwards a dozen of them were folded into a new Crown Corporation called Canadian Arsenals Ltd. Postwar Canada’s ammunition needs were modest. The federal government closed many of its plants, and by the 1960s it began leaning towards privatizing the rest. The first to go was the Valleyfield explosives plant, sold in 1965. But this was no typical privatization. The Cold War was on, and Ottawa’s confidence in foreign manufacturers hadn’t improved. Meanwhile, its plants were in a woeful state; They lost money, lacked skilled workers and had no offshore customers to speak of. The federal government spent eight years restructuring Canadian Arsenals to attract buyers. More importantly, Ottawa laid the foundations for a new relationship with private ammo makers. Introduced in the mid-1970s, the Munitions Supply Program designated half a dozen private companies as “preferred suppliers,” effectively granting rights of first refusal for federal ammunition or small arms orders. The government also promised these companies notice of ammunition needs two years in advance, to help them manage their production lines. GD-OTS Canada also receives monthly payments from the Department of National Defence intended to “compensate the company for fixed costs such as overhead and maintenance, and enable reinvestment into the facilities.” Those payments amounted to nearly $70 million in 2016, and more than $75 million last year. In return, the MSP companies promised to maintain and modernize their Canadian plants. They vowed to maintain surplus capacity such that they could quickly accelerate production if asked. And they promised to prioritize federal orders over those of international customers. It worked. As Ottawa sought to extricate itself from making bullets, Quebec’s SNC engineering group was looking to diversify. During the 1980s it bought two WW2-era ammo plants (in Valcartier and Le Gardeur) and, years later, the Valleyfield explosives plant. For two decades SNC enjoyed a virtual monopoly selling ammunition to the federal government, while also expanding its export sales. It sold out to General Dynamics in 2007 for US$275 million. But observers said Ottawa’s concerns about buying ammunition offshore is not unjustified. Charles Davies was a procurement officer for the Department of National Defence during the 1980s. He later commanded an ammunition depot, and after that served as a senior director responsible for material acquisition and support policy. Now retired, in recent years he’s consulted for both government and the defence industry. More than 40 years after the Munitions Supply Program’s implementation, Ottawa no longer bears the burden of operating its own ammunition plants. But it still shoulders much of the associated costs and business risks. Last year, Ottawa agreed to pay GD-OTS Canada nearly $46 million simply to maintain its Le Gardeur plant “in suitable condition” to supply ammunition to Ottawa. With the Cold War a fading memory, the MSP has long attracted accusations that it has become an expensive anachronism. More than a decade ago, the Department of National Defence’s Chief Review Service evaluated the program as part of a larger review of the department’s ammunition purchasing practices. The MSP suffered from insufficient management controls and ill-defined expectations, its report concluded, and was out-of-step with Ottawa’s strong and growing preference for competitive tenders and off-the-shelf procurement. And it wasn’t as if Canada had become truly self-sufficient: Domestic ammo makers remained “highly dependent” on foreign technology and components. “If the MSP is to continue in any form, improvements are required to all elements,” it concluded. Indeed, the report suggested the domestic ammunition industry had matured to the point where it no longer needed Ottawa’s intervention. Yet the MSP continued largely unmodified, although the number of preferred suppliers has dwindled to four: GD-OTS Canada, IMT Corp, Magellan Aerospace and Colt Canada. Not only do they continue to supply as much as three-quarters of the Canadian Armed Forces’ ammunition, but in recent years the MSP has been used to procure weapons and ammunition for the RCMP, Correctional Services, Fisheries and Oceans, the Canada Border Services Agency and even Parks Canada. The American government, whose ammunition purchases dwarf Canada’s, actively seeks to avoid creating such monopolies. Indeed, when General Dynamics proposed to purchase SNC’s ammo operations more than a decade ago, the U.S. Federal Trade Commission worried the combined company might wind up with a North American monopoly for artillery shells and mortar rounds. It forced General Dynamics to sell off some of its U.S. operations before allowing the transaction to proceed. The MSP’s logic was last tested during the deployment of the Canadian Armed Forces in Afghanistan. A 2015 federal study of how MSP suppliers responded confirmed GD-OTS was able to meet surging demand while at the same time shrinking lead times: Delivery times for 5.56 mm ammunition, which had been more than 40 months in 2004, fell to less than 20 months. “GD-OTS-C and the MSP provided a reliable source of ammunition during a period of high demand,” the report concluded. Editor’s note: A previous version of this story incorrectly said military small-arms ammunition must conform to the Geneva Protocol. In fact, they must conform to the Hague Convention. This version has been corrected. The roughly 75-year-old Le Gardeur load-assemble-pack plant, located on the outskirts of repentigny, Quebec, is the most important ammunition plant in Canada. One of three manufacturing facilities owned by GD-OTS Canada, it features more than 150 buildings. Rather than storing raw materials and finished ammunition in large warehouses, a series of more compact buildings is used. The smallest buildings to the west are intended for the most explosive materials, such as fuses. Many of these buildings are surrounded by thick barricades to protect from adjacent explosions and prevent “low-angle, high-velocity fragments from coming in,” says Charles Davies, a retired army colonel and former logistics officer.